Bridgestone, The Official Tire of the NHL and the NHLPA, has partnered with NHL Network™ to create "Captains Driven By Bridgestone," a 20-part original series that will profile the Canadiens’ Saku Koivu on April 14 at 7:30 p.m. ET. There was hesitancy in Saku Koivu's voice ... and in his mind. The veteran center admits today that about an hour after he was named the 27th captain of the Montreal Canadiens in September 1999 -- and first European-born captain of hockey's version of the New York Yankees -- it hit him what an honor had just been bestowed on him. "I remember I was afraid," Koivu said. "Scared isn't the right word. I remember not really realizing the importance right away ... but, then, I remember thinking, 'Wow! What just happened?' "
Koivu’s journey as captain of the Canadiens will be chronicled on Captains Driven By Bridgestone Tuesday, April 14 at 7:30 p.m. ET. Captain of Les Habitants, the name and history that just rolls off your tongue, following legends/captains like Newsy Lalonde, George Hainsworth, Toe Blake, Bill Durnan, Butch Bouchard, Maurice and Henri Richard, Bill Durnan, Doug Harvey, Jean Beliveau, Yvon Cournoyer, Serge Savard, Guy Carbonneau, Bob Gainey, Chris Chelios, Kirk Muller. "I remember kind of flashing back to my rookie year back in 1993, when I walked into the locker room at the Montreal Forum for the first time and saw all of those pictures of the great players in Montreal Canadiens history," Koivu said. "We didn't see much of the NHL on TV back in Finland. Honestly, I didn't know Montreal from St. Louis or Toronto at that time. But I learned quickly about the tradition and the success of this franchise." Particularly on the last night at the old Forum. 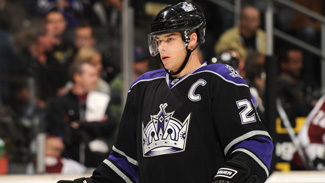 Dustin Brown, 24, is the youngest captain in Kings history, but he doesn't look inexperienced at all. "All the Montreal captains, passing the torch. It was really special," Koivu said. "I remember looking up in the crowd. Some fans were pointing their fingers at these legends. Some were crying. Real tears. There was an aura of respect for every one of those legends. I think that night, for me, really underscored what being a captain of this great organization meant to everyone." To some this 5-foot-10, 187-pound center looks like a quiet man. To some in LaBelle province, it was blasphemy when the Canadiens' players voted for a player from Turku, Finland, to be the captain. While Koivu may never reach the size or magnitude of respect of a Rocket Richard or Jean Beliveau, the Montreal players didn't make a mistake when they chose Saku over Shayne Corson in a very close vote. What was clear to those teammates was they had seen the competitive fire in the eyes of this then-25-year-old warrior. Some of them saw him grow up big-time at the 1998 Olympics, when he could be seen up close, directing traffic, barking out instructions to his teammates from Finland, who won the bronze medal that year at Nagano, Japan -- and that included respected players Jari Kurri, Teemu Selanne, Esa Tikkanen, Teppo Numminen and Jere Lehtinen. And now, 10 years later, Koivu has proven to everyone that he's a powerful leader -- second only to Jean Beliveau's 10 seasons as captain of Les Habitants. What's important about that is that six others preceded him as captain of the Canadiens in the 1990s ... and all were traded away. But Koivu has not only survived, he has thrived. "We all knew what a fighter, a battler he was on the ice," veteran defenseman Patrice Brisebois said. "But when we saw him knocked down by cancer in training camp in 2001 ... well, that was a real battle. We'd all heard the predictions that not only his hockey career but his life were in jeopardy, we knew that if anyone could beat this, it would be Saku. And then, there he was back at the end of the season and leading us to a first-round playoff win over Boston. That's a leader." Saku Koivu received eight treatments of chemotherapy for abdominal cancer that struck him down just prior to training camp. He was weak, lost his hair, but never lost his will to live, his will to get back on skates. "I remember I was afraid. Scared isn't the right word. I remember not really realizing the importance right away ... but, then, I remember thinking, 'Wow! What just happened?'" "You look at the player, but, more important, you look at the man and what kind of teammate and leader he is," said Carbonneau, now the coach in Montreal. "Saku is the consummate teammate." You needn't look further than the bloodlines. Jukka Koivu was a defenseman and later coached at the Finnish Elite League level for TPS Turku and clearly had a firm hand in the well-rounded play of both of his sons. Tuire Koivu was a nurse. Both parents showed their sons Saku and Mikko, who is currently the captain of the Minnesota Wild, that success comes only from hard work. The only time Saku had been captain before was for the Finnish national team. He obviously learned the job well. Still, he says, you look for advice from teammates ... and former Montreal greats. "I've seen so many of the Montreal greats come through the locker room. I've seen the respect they get. It's really something special," Koivu said. "I remember Mr. Beliveau coming up to me to shake my hand after I was named captain. He looked me straight in the eyes and said, 'Being captain of the Canadiens is a great honor. If you ever want to talk, just knock on my door.' "
The two have talked on many occasions, about the team, the history and personal things. It's a powerful bond being in that small fraternity of players who can say they were captain of the Montreal Canadiens. "There are probably things about this job that I won't fully appreciate until I'm retired. It's a huge responsibility," he said, choosing exactly the right words to describe the honor he feels. "I remember wondering what I would have to do differently after they put the 'C' on my jersey -- and one of my teammates said, 'Don't be different at all. We chose you because of how hard you compete and what kind of teammate you are.' "
Don't be confused. This is the supreme test of captaincy, where nothing hockey-related goes unnoticed in Montreal. Koivu clearly has withstood the test of time, even if his Canadiens teams have not won a Stanley Cup since 1993, the year before Saku arrived in North America. You could say that on that day when Jean Beliveau offered free advice to Saku Koivu that, in that moment, one Montreal great passed the fabled torch to what has proven to be another great captain.